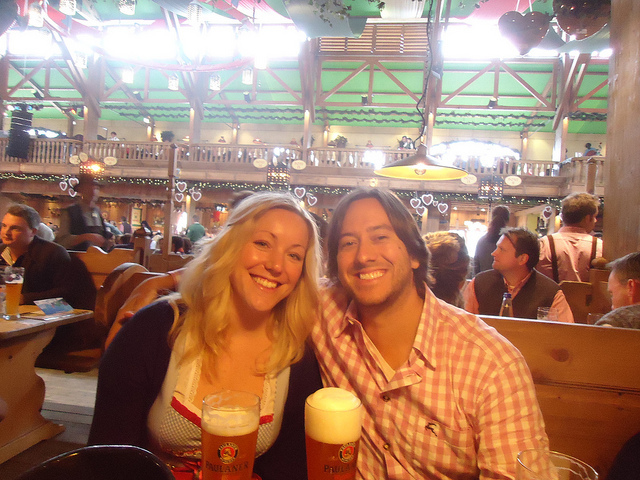 The great thing about Oktoberfest beer tents is that no matter which one you stumble into, you are going to have the time of your life. So, it’s not worth losing too much sleep over which one to go to. With that being said though, not all beer tents are created equal and picking the right one for your personality will go a long way to ensuring you have a successful Oktoberfest. The most important thing to remember when choosing between Oktoberfest beer tents is that there are two types of tents in Munich: big ones and small ones. 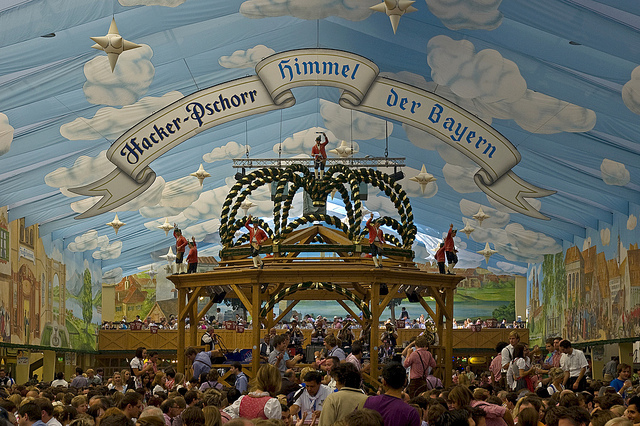 The big Oktoberfest beer tents are called “fest halls”, and these are the ones you have probably seen on TV that are home to thousands of guys wearing lederhosen and girls wearing German dirndls toasting, singing, dancing, and going berserk, in a good way. The smaller tents are a bit more laid back and relaxed, but they are also still home to bands and all kinds of good times, so I think hitting at least one smaller tent gives you a more well-rounded Oktoberfest experience. 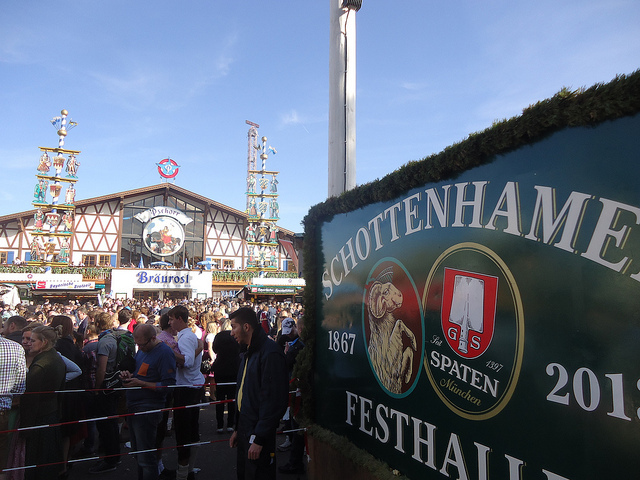 After four trips, I definitely have my favorites, so here are my picks for best Oktoberfest beer tents, both big and small. I will start with this one as it is hands down my favorite and it is the tent where Oktoberfest is officially kicked off every year by the mayor of Munich. The mayor taps the very first keg and then fittingly declares ‘It’s tapped!” to the masses, ushering in a new year of sudsy fun and frolicking. This tent is absolutely perfect in my opinion, and if you could only go to one of the 14 big Oktoberfest beer tents, this is the one. Schottenhamel is very popular among the younger set, and that creates a fun and friendly atmosphere throughout that I just haven’t experienced in as much abundance at the other tents. In contrast to some other tents where almost all of the people around you will be tourists, in Schottenhamel you will be outnumbered by locals, who will almost all be the utmost of friendly and fun. Basically, go here or you will regret it for the rest of your life. Billed as “Bavarian Heaven”, this one makes my list based mostly on the interior design of the tent. The sky and clouds that are painted on the ceiling here create a fantastic atmosphere, and even if the weather outside is a bit sketchy, sitting here always feels light, sunny, and the epitome of what Oktoberfest is all about. The music here is more rock-n-roll than traditional and it is a great spot for late night fun as it seems to get a perfect mix of tourists and locals. I never regret a stop here. Looking like something straight off the board game Candy Land, Café Kaiserschmarrnk is a sight for sore eyes, and that’s perfect because your eyes are going to be sore in the morning after the previous day’s festivities. 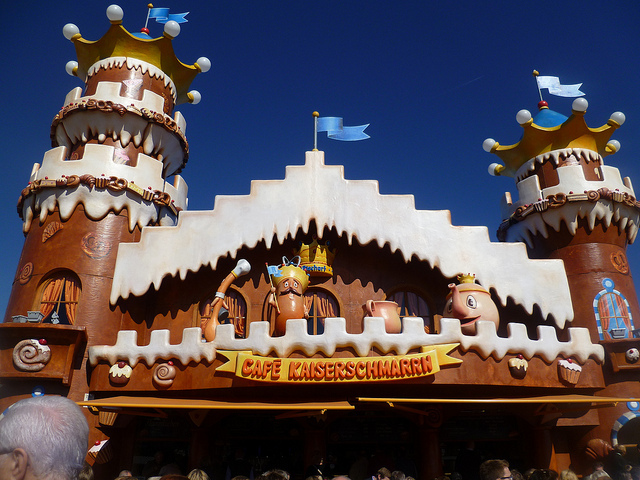 Café Kaiserschmarrn is one of the smaller Oktoberfest tents, but what it lacks in size it makes up for with pastries and is hands down the best place to start your day off at Oktoberfest. Café Kaiserschmarrn opens early for breakfast and serves a fanciful assortment of coffee drinks and wholesome German breakfast treats. If you are in the mood to get your beer drinking started early though, they have that too. Music starts here in the afternoon and a slightly subdued party atmosphere soon follows. Augustiner is the last of the big six Munich breweries to be independently owned, and as a result has a beloved place in almost all Munich residents’ hearts. A stop here is always one of my favorite moves and while the Augustiner beer tent isn’t quite as aesthetically charming on the interior as some of the others, it’s relatively calm and peaceful atmosphere more than makes up for it. 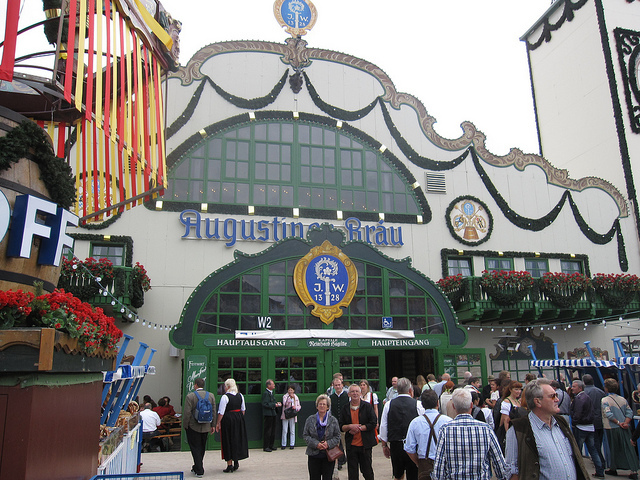 Augustiner is the perfect big tent to balance out an earlier stop at a rowdy and tourist-heavy tent like Hofbrau. This one is for the classy people, but despite this fact, they let us in for a couple hours. As you may have guessed from the name, this is the wine tent at Oktoberfest, and while you could certainly go for one of their fine varieties of wine, I stuck to the only beer they serve and coincidentally my favorite type, weiss beer. What makes this place great though is the calm, chill, and dare I say elegant atmosphere that makes you feel like you are in the great hall of a Bavarian castle. Just like the Café Kaiserschmarrn tent, it’s a perfect first stop of the day or a perfect spot to catch your breath in the middle of the afternoon while you make your game plan for the rest of the day. 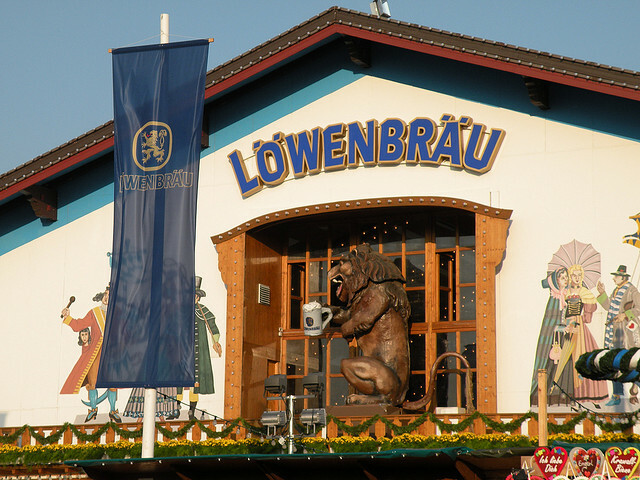 As far as the big tents run by world-famous breweries (Hofbrau, Paulaner) are concerned, Lowenbrau is definitely my favorite. First off, the big lion out front is pretty cool and the atmosphere in here is always fun without being too rowdy. The band here is without a doubt one of the best at Oktoberfest, and on balance, you might just get the most well-rounded experience at Lowenbrau. With nearly 3,000 outside seats, it’s a great place to go on a nice day too. For all things Oktoberfest, you could always check out the official Oktoberfest website, too.